Policymakers are increasingly designing policies that encourage patient choice and therefore mobility across providers. Since prices are regulated (fixed) in most countries, providers need to compete on quality to attract patients. This chapter reviews the current theoretical and empirical literature on patient choice and quality competition in health markets. The theoretical literature identifies key factors affecting incentives to provide quality. These include: altruistic motives, cost structure, number of providers, demand responsiveness, GP gatekeeping, degree of specialization, profit constraints and soft budgets. We also review the theoretical literature on choice across different countries (e.g. within the EU) or regions within the same countries. 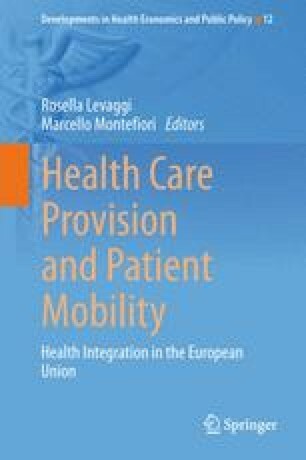 The chapter reviews selected empirical studies that investigate whether demand responds to quality and waiting times, the role of patient’s mobility and the effect of competition on quality. Beckert, W., Christensen, M., & Collyer, K. (2012). Choice of NHS-funded hospital services in England. Economic Journal. doi: 10.1111/j.1468-0297.2012.02496x. Bloom, N., Cooper, Z., Gaynor, M., Gibbons, S., Jones, S., McGuire, A., et al. (2012). A response to Pollock et al (2011). http://www.bristol.ac.uk/cmpo/publications/other/cpresponse.pdf. Gaynor, M., Propper, C., & Seiler, S. (2010). The effect of patient choice. Evidence from recent NHS reforms. cep.lse.ac.uk/conference_papers/10-05-2010/seiler.pdf.